Normal numbers of gametocytes are produced. Male and female gametocytes show a defect in egress from the host erythrocyte. MTRAP undergoes extensive processing during invasion. 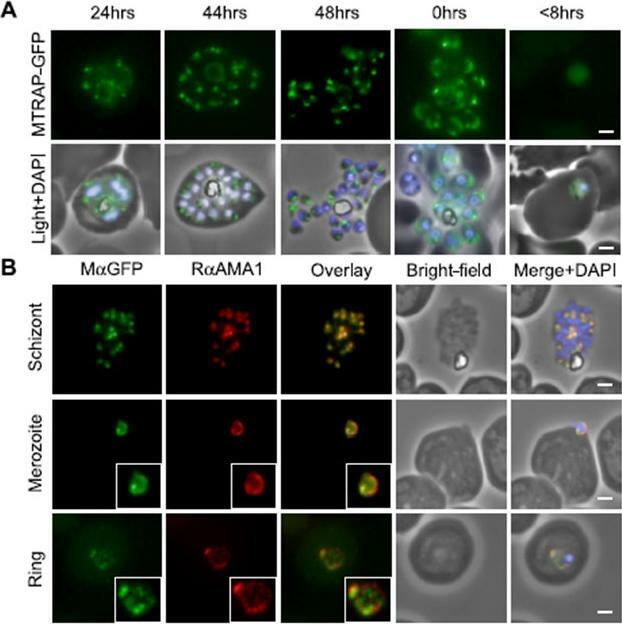 A, episomally expressed MTRAP-GFP followed through the life cycle confirms apical localization (44–48 h) suggests the release of MTRAP onto the surface of free merozoites (capping, 0 h) and suggests that, despite processing, the cytoplasmic tail is carried through to newly invaded rings (<8 h). B, this is confirmed by following co-localization with antibodies that recognize AMA1, which have been previously reported as being carried through to rings. 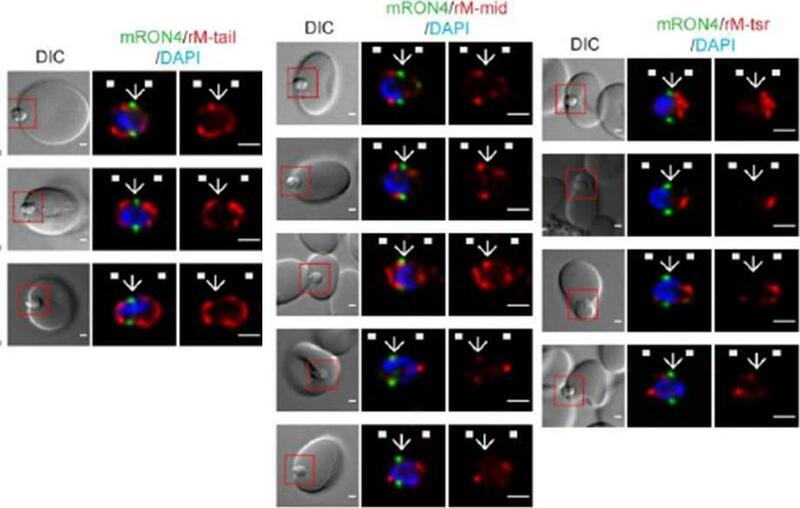 In early ring stages, there does not appear to be direct co-localization, suggesting that they may be associating with different compartments. Baum J, Richard D, Healer J, Rug M, Krnajski Z, Gilberger TW, Green JL, Holder AA, Cowman AF. 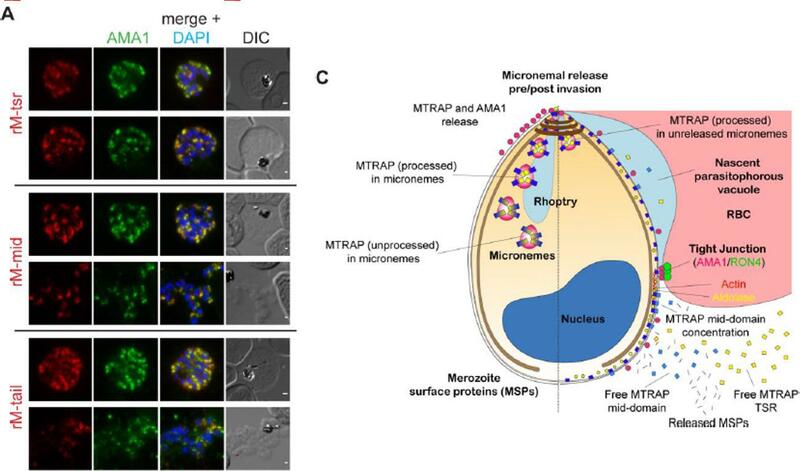 A conserved molecular motor drives cell invasion and gliding motility across malaria life cycle stages and other apicomplexan parasites. J Biol Chem. 2006 281(8):5197-208. Schizont rich culture was thin smeared on a glass slide, fixed in methanol, stainined with rabbit anti-MTRAP polyclonal serum (1:200) and secondary Alexa-Flor488 anti-Rabbit. Dual colour fluorescence images were captured using a Carl Zeiss Axioskop 2 microscope at 100x using Oil imersion. Nucleus is marked with DAPI. Scale bar indicate 1µM. Free merozoite is shown with MTRAP clearly marking the apical end (shown to be micronemes by immuno-EM).Baum J, Richard D, Healer J, Rug M, Krnajski Z, Gilberger TW, Green JL, Holder AA, Cowman AF. 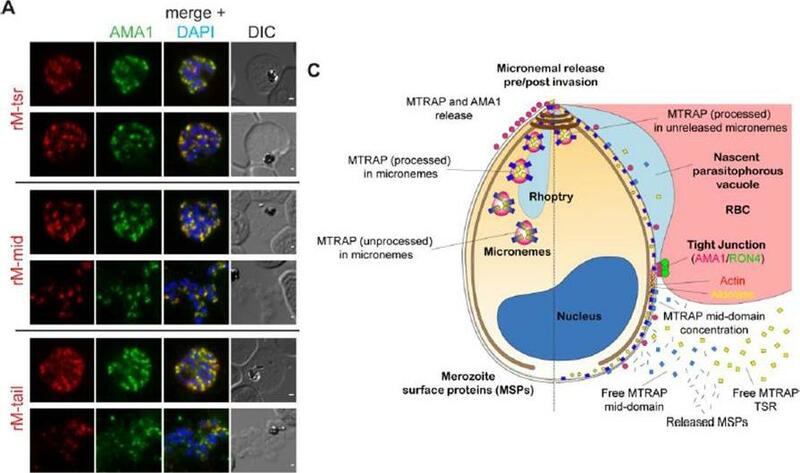 A conserved molecular motor drives cell invasion and gliding motility across malaria life cycle stages and other apicomplexan parasites. J Biol Chem. 2006 281(8):5197-208. Expression of GFP-tagged MTRAP in asexual blood stage parasites. Fluorescent images of live parasites expressing GFP-tagged MTRAP (green); nuclei (blue) were stained with Hoechst dye prior to microscopy. Merged and bright-field images are also shown. 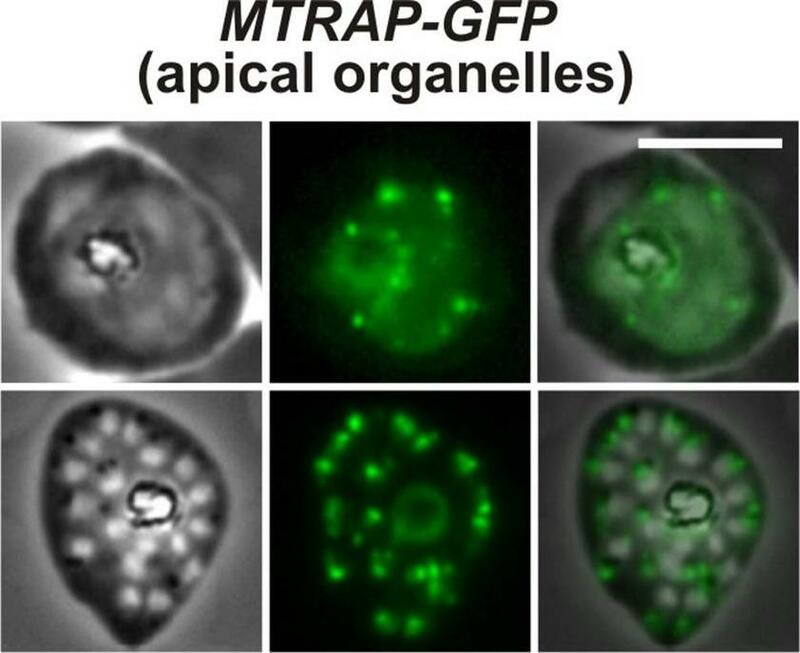 The GFPtagged MTRAP is seen in a subcellular location suggestive of an apical organelle. Diaz SA, Martin SR, Howell SA, Grainger M, Moon RW, Green JL, Holder AA. 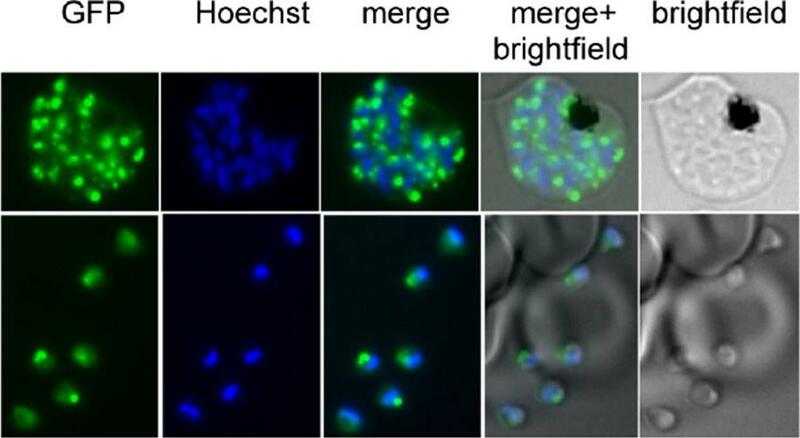 The Binding of Plasmodium falciparum Adhesins and Erythrocyte Invasion Proteins to Aldolase Is Enhanced by Phosphorylation. PLoS One. 2016 Sep 8;11(9):e0161850.